As well as being the day of the mad hatters tea party and comedy on the common, which sound all pleasant and fun, today is also the day where the many alternatives to the TINA line are being voiced. The Shooters Hill area has been affected by the cuts, with people losing work, terms of work, quality of work, trade, pension arrangements, salaries and so on, and services are being run down in what is currently the front line in the cuts: local authority provision. Anyway, having rambled on fairly tiredly about politics, I hope that tomorrow does something to alleviate the suffering that is being caused, and that although the greater good is being phased out, the NHS can still be protected from a future where patients are traded as commodities. Christ Church School are having a Mad Hatters Tea Party on Saturday 26th March from 11:30am – 2pm in the hall beside the church (and the school playground if the weather permits). There will be a Thai Spa present offering mini massages, Phoenix cards, a jewellery stall for children to make their own items and hopefully a flower stall too, as well as face painting, tombolas and games plus hot drinks and cakes (donations welcome!). There will also be a Mad Hatters Hunt for children and a Mad Hatters Parade for the best home made bonnet. In a twist of serendipity, just as one Plumstead festival dies, another springs to life[1. the festival has another website too], thanks to the PiP. The theme of the Festival, The Edge of the City, was chosen to evoke not only the idea of a geographical location, but a psychological state of mind. Our Festival has recognised the possibility of marginalisation of certain members of society who do not always have a voice, because of their ethnicity, age, disability, perceived social background, sexuality or income. These issues will be articulated in the selected films and discussed with filmmakers and their guests. The festival will be a fantastic opportunity for the local community to interact with filmmakers, both amateur and professional and to enjoy a free cultural event in the local area. We have also developed this event to bring together members of the community. We will be inviting members of arts groups and institutions, local authorities, representatives of schools and community groups, and members of the press to attend and participate in our activities. We hope the network that is formed at this event will blossom into relationships that will benefit the local community and its representatives. 19th March 2011 – 2pm to 7.30pm: At St Patrick’s School Hall, Griffin Road, Greenwich, London SE18 7QG. This day is open to the public and is committed to screening documentaries and drama films other than those entered into the Festival competition. There will be a special screening of the film ‘Covered’ at 15.30 – documentary discussing the meaning of the scarf for women from different cultures. There will also be an opportunity to watch and be involved in a film editing process of a short drama Love in SE18. 20th March – 12pm to 7.00pm: At Tramshed Youth Theatre, 51 – 53 Woolwich New Road, London SE18 6ES. We will start at 12pm with screenings of shortlisted films, moving on to the awards ceremony at 2.30pm. At 4pm this year’s best films will be screened followed by Q&A’s with their directors. There will also be a special screening of the film ‘LOVE in SE18’ at the end of the day. The bar will be open throughout this event which will conclude with a networking party. This is another slightly tenously linked Shooters Hill story, but I’ve been collecting local poems for a while, and so am hoping that this will aid me in my search. An selondon poetry magazine called South Bank Poetry is staging a new open competition, and are reaching to all who might be interested in joining in, so please read on if you are feeling poetic. Niall O’Sullivan (who will read every entry). 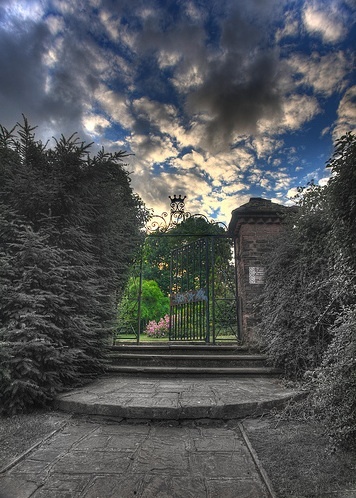 Poems up to 50 lines with a London focus or context. The full rules are published in South Bank Poetry Magazine. The judge’s decision is final. 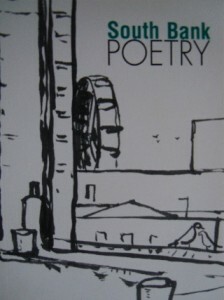 Prize-winning and commended poets will be listed on the Poetry Book Society website by mid-June 2011. First Prize: One year’s Charter Membership of The Poetry Book Society. Winner receives 20 new poetry books which are PBS Choices and Recommendations, plus other benefits. Second Prize: £200. Third Prize: £150. Fourth Prize: A pair of tickets for the 2012 T.S. Eliot Award readings and a two-year subscription to South Bank Poetry magazine. Fifth Prize: A pair of tickets for the 2012 T.S. Eliot Award readings and a one-year subscription to South Bank Poetry. Five commended poets will receive a one-year subscription to SBP magazine. 1st poem £3.50, 2nd poem £2.50, 3rd poem £2.00, 4th poem £1.50; or 5 for £10 and £1 for each additional poem. Current subscribers to South Bank Poetry magazine are entitled to the following discounts: 1st poem £3.00, 2nd poem free, 3rd £1.50, 4th £1.00; or five poems for £6 and £1 for each additional poem. Contact: UK cheques or postal orders crossed, payable to Peter Ebsworth. No entry form required, send two copies of each poem, one anonymous, the other with contact details, to: Peter Ebsworth, South Bank Poetry, 74 Sylvan Road, London SE19 2RZ. New subscribers may enter poems at the reduced rate if they add £9 (for a three issue subscription inc. P&P) to their total payment. All entries will be simultaneously considered for publication in South Bank Poetry magazine if a contact e-mail address is included. Friday 8 April, 8pm at the Poetry Café, 22 Betterton Street, WC2H 9BX. As someone said recently, why go to the dome to watch a band on a screen when you can see the real thing at the Bull. I went to a great little gig there last Saturday, it was one of those so bad it’s good kind of gigs, with much hilarity ensuing over their demolition of the music of David Bowie (well, Suffragette City was ok, but Starman has got some pretty ouchy high notes in it)… anyway, this was made up for with some great glam stompers and iggy pop, the nation’s favourite insurance salesman. I think there’s a Rockabilly night there starting tomorrow from 7, with the Smokin Aces on at 9pm. Another band that sometimes plays there (and at the woods café) is OCD, and here’s a little video of them to give an idea of the live music offering at the Bull; it’s worth listening through to around 3:30 minutes at which point the drummer turns into animal from the muppets! For those who prefer to observe and perform, I believe there’s also karaoke at the Red Lion this weekend, courtesy of @pitstopmark although i’m still trying to confirm this, i think it’s tonight. –update Yes, it’s confirmed that karaoke is on Fridays from 8:30 at the Red Lion, and this has been (perhaps) neatly timetabled so as not to clash with the Live music up the Hill. Right, that’s it, Greenwich’s longest running festival has been cancelled. I know that conspiracy theories have been floated to the effect that the council are withdrawing support from community events as part of the cuts blame game, but as the organisers of the event acknowledged on the in the meantime radio show, the council has to make the vulnerable a priority now. The fact that this event has been going since 1978 only to be stopped now just goes to show how severe the cuts are; and as one of the important elements of ‘social glue’ that binds the fabric of Plumstead society together, the make merry’s loss is also our loss. Despite this, the rallying of local people to bring back the festival in 2012 has already begun, and a benefit gig on the evening of the 16th of April at Plumstead Pavilion has been arranged as the first step on the way to the future. According to the newsshopper report, the council have offered to try and help with applying for lottery funding, as they begin to concentrate investments in potentially lucrative projects such as the forthcoming greenwich summer sessions. It is with great disappointment and regret that the organising committee for the Plumstead Make Merry have to announce that there will not be a Make Merry on Plumstead Common this year. Due to central government cuts in local authority funding, Greenwich Council have been forced to cut the funding on which the Make Merry has depended on for its infrastructure. The committee is made up of local people who all volunteer their time and efforts for free, we do not make a profit, and proceeds from our tea tent and stalls are spent on staging, marquees, sound equipment and on providing free activities for children. The Plumstead Make Merry has been held on Plumstead Common every year for the last 32 years. It is the most eagerly awaited local event, and the longest running event in the borough. Last year, over 6,000 people visited the festival. We, the Plumstead Make Merry Committee are devastated that there will not be a festival this year, and we know that we are not alone in this feeling. The Plumstead Make Merry is an important event in the community calendar. We provide a unique opportunity for local charities, voluntary organisations and small businesses to raise awareness of the services, products, information, advice and guidance that they have to offer. As well as this, the Plumstead Make Merry strives to ensure that everyone in our diverse community has the opportunity to be involved. Our funding cut will have an impact on everyone that lives in Plumstead, and beyond. The Plumstead Make Merry is a celebration of our vibrant, talented and diverse community and will be a great loss to thousands of people. Generations of families have attended the event but due to our lack of funding will not be able to do so this year. The summer of 2011 in Plumstead won’t be the same this year without the Plumstead Make Merry. However, we will rise above the cuts. We could spend our time and energy complaining about the cuts and campaigning against them – but we won’t, there are many other cuts happening within the borough and nationally, instead, we are dedicated to ensuring that a Make Merry will take place next year. We are appealing to you, the community, to help us. Throughout the year we will be fundraising and making sure that the Plumstead Make Merry stays in the hearts and minds of local people. Don’t forget the Make Merry, it’s an event put on by local people for local people, it is your celebration of our community. We are determined to show that the community is bigger than the cuts, and that we can survive. We appeal to everyone to support our fundraising events so that the 2012 Plumstead Make Merry will go ahead, whatever happens with the budget cuts. We have a great night of entertainment planned for Saturday 16th April 2011 when the ‘Benefit Bash for the Plumstead Make Merry’ will take place in the Greenwich Rugby Club Pavilion on Plumstead Common, (Old Mill Road, London, SE18). Entry will cost just £5 at the door and all proceeds will go towards supporting the festival. There will be live music, karaoke, disco and fun and games. The fun starts at 7:30pm, and we hope to see you all there! The next event is on Saturday 11th June 2011 – the day the Plumstead Make Merry was due to take place. It will also take place at the Greenwich Rugby Club Pavilion on Plumstead Common, and for a small donation of £5 you can expect a day and evening of non-stop entertainment. This dub is named in reference to Shooter’s Hill in Jamaica, which is where Keith Hudson, this track’s producer, was from. It’s a quirky one, with guitar strumming on the downbeat, an uncharacteristic fuzzbox and the use of a tremelo – quite experimental in fact. In some ways it works quite well as an anthem to the selondon version of Shooters Hill, especially at the moment, as its slow moving tension perfectly captures the rather frustrated tone of current shooters hill tweets, written by a lot of people letting off steam whilst they sit in 40-minute traffic jams caused by the emergency gas works. Anyway, even if this story is rather tenously linked to the hill, at least it isn’t yet another post about the farm. The track is taken from an album entitled `entering the dragon’, and on this strength I rather hastily assumed that the cover photo was a picture of the artist performing a flying kung-fu kick; on closer inspection however it became clear that he was instead kicking back on a sofa – oh well, at least it’s got a star of david to liven things up in the righteous warrior department. Whilst looking this up, I also noticed that the famous pickapeppa sauce, which can be found in all good sauce shops, is also from the very same Shooter’s Hill, so not only have our twin-hill over the Atlantic got their own dub, but also their own famous sweet and spicy sauce too. What have we given to the world given to the world in return… Boy George and Fanny Craddock I suppose. 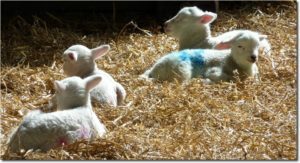 Now that the signs of spring are showing, the farm is moving into the lambing period, and have announced the details of the first of their big seasonal events for 2011: Lambing Day. This and further activities have been added to the calendar, and will appear on the front page as they draw closer. All are welcome at the Woodlands Farm Trust Lambing Day. Come and see our new-born lambs, and enjoy the chance to buy quality local produce at reasonable prices, including home-made preserves, cakes and honey. Relax in our café, enjoy the treasure hunt or get involved in craft activities. A great family day out! Entry is £1 for adults and 50p for children, and all proceeds go towards caring for our animals. No booking required. Come and see what the farm is like after dark! Try your hand at moth trapping, listen to bats with our bat detectors, and keep a look-out for other nocturnal animals like owls and hedgehogs. £1 per person, or FREE for farm volunteers and Members of the Woodlands Farm Trust. Booking required; please email or call the farm office during office hours. Please note that all children must be accompanied by an adult. Come and visit us during the Easter Holidays, and meet some of the wildlife on the farm. All activities are drop-in; no booking required. Please note that all children must be accompanied by an adult.